For the most part, the innerworkings of a Lego brick aren't all that complex. It's just a matter of good Geometry, really. 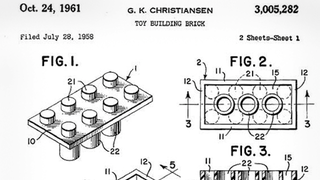 But looking at these patent sketches submitted in 1958 (and granted in 1961), make me happy that Lego didn't have to live in an era where their efforts might be thwarted by a patent troll. Our childhoods would have been lesser because of it, even if we never realized it.